Long before a cleaver is raised, Victor Puharich and our family of butchers and chefs personally select each producer and product to ensure the quality of produce available on our shelves is unparalleled. Blackmore Wagyu is an award winning and internationally recognised producer of 100% Fullblood Wagyu beef - cattle that are not diluted with any other breed. The Blackmore Wagyu farm is situated in the Victorian high country, selected for its natural lagoons and old river red gums allowing the cattle to be bred in a natural, sustainable environment. Blackmore Wagyu maintain 100% Fullblood Wagyu genetics to ensure their beef represent only the highest grade of 9 and 9+. Rangers Valley is one of the world's most respected premium marbled beef producers specialising in pure Black Angus and Wagyu cross breeds. Located in the New South Wales New England Tablelands, the cattle are farmed under world class methods resulting in the highest quality, best tasting, consistently tender and delicious beef. Victor Churchill are proud to be the exclusive retail supplier of Black Market beef by Rangers Valley which is usually reserved for the best restaurants. Exclusive to Victor Churchill, rare breed Kurobuta Pork is farmed in Northern New South Wales. Kurobuta Pork is one of the most highly prized meats available and is internationally renowned for being of exceptional high quality. Often remarked as being the Wagyu of the pork world. This pork comes from an ancient breed of British pig, known as the Black Berkshire. O’Connor Beef produce some of Australia’s best grass fed beef. For over 25 years O’Connor Beef has been providing premium beef from the pristine Gippsland region of South East Victoria. With abundant, nutrient rich pastures cattle graze on natural clover and rye grass that provide protein, vitamins and minerals and result in meat that is free of genetic modifications, hormones, antibiotic or chemical residues. Saskia Beer has been tending to game animals since she was 11 years old and has amassed an exceptional understanding of what is required to produce superior game. The meat is slightly darker because they are free to roam and develop their muscles naturally. The result is a chicken that tastes like chicken is supposed to, remarked as being flavoursome, plump and juicy. Renowned for its unrivalled quality, Japanese Wagyu Beef is the ultimate beef experience. Of Japanese Wagyu, Kobe Beef is the most prestigious fullblood wagyu brand in the world, revered for its pure lineage and unforgettable flavour. Kobe Beef is produced from pure blood Tajima-gyu, a black breed born and farmed in Tajima district, Hyogo Prefecture. Tajima cattle are regarded as the pinnacle of Japanese wagyu, raised in a natural, stress-free environment in the mountains of Hyogo Prefecture with access to quality feed and fresh, clean water. Pork from Near River Produce comes from their farm in the pristine hinterland of the NSW Mid North Coast. Here the heritage breed Wessex Saddlebacks are allowed to spend their lives foraging and wallowing in open paddocks eating a varied diet of grains, mixed pastures and vegetables. This lifestyle and diet along with the breeds genetics and the longer time to reach maturity are what we believe gives Near River pork the sweet full flavoured taste that it is renowned for. Grassland Sommerlad chickens are slow-grown and pasture-raised in the foothills of the Central West Slopes and Plains of NSW. Ethically farmed, the heritage breed chickens are free to roam and forage. The best produce comes from the best environment; one that is regenerated, nourished and sustainably farmed. The first and only true rose veal in Australia. Nurturing high quality veal with a flavour and tenderness that reflects the care and attention shown to the calves, the Torello Rose Veal farming method takes male calves, gives their life value, resulting in far superior veal quality than anything seen in Australia to-date. Never before has the food industry seen such purposeful and respectful farming of Veal. WITLOFT is an artisan Dutch leather brand founded in 2014. Established from a love for cooking and furniture-making, WITLOFT leather aprons are perfect for those with a passion for quality, handcrafted and artisanal style products. Each apron is crafted by hand, from high quality vegetable-tanned saddle leather of Dutch origin. Leather, being a natural product, allows the aprons to age beautifully over time and wear, telling the story of the wearer and making each piece truly unique. The Olsson Family has been making solar sea salt since 1957 near the Great Barrier Reef in Queensland and near the Great Australia Bight in South Australia. Pristine Australian water, sun, and wind work in harmony to create the purest Australian sea salt. Penelope Ransley carefully handcrafts pastries and sweets at her Leichhardt bakery Penny Fours. A selection of Penny Fours buttery croissants, seasonal danishes and sticky buns are available at Victor Churchill every week from Friday to Sunday. Feeding Sydney from the fertile soil, river and pastures of the Hawkesbury, Martin Boetz’s Cooks Co-Op delivers the freshest local produce. An incredible range of in-season Hawkesbury produce is in store at Victor Churchill from every Friday and over the weekend until sold out. Home of the freshest French black truffle, Turalla Truffles is set on the picturesque Southern end of the Lake George Basin in NSW. 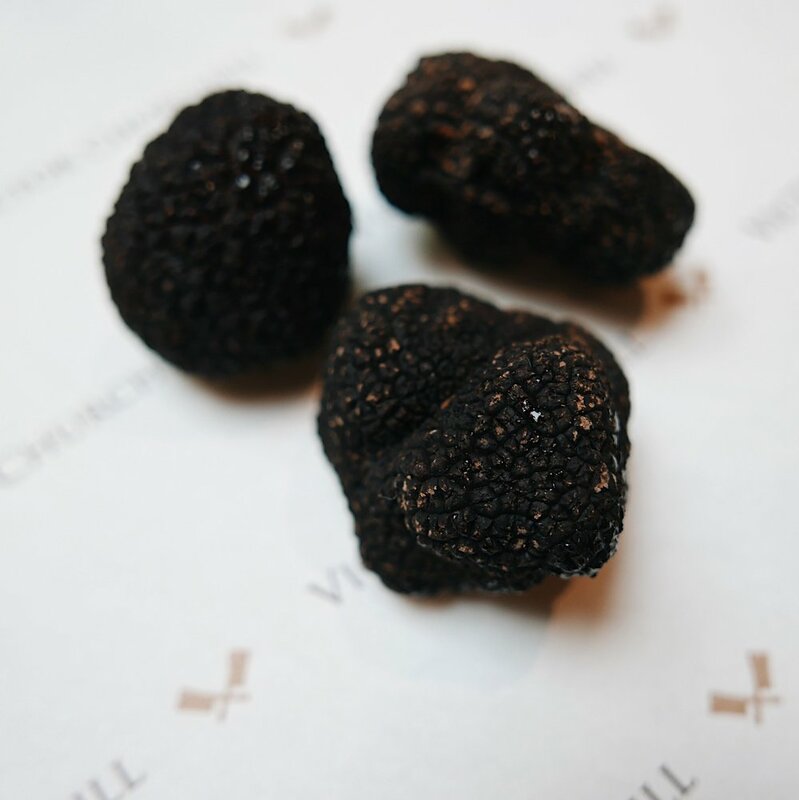 Fresh Turalla truffles and Victor Churchill truffle products are only available during truffle season over winter. Victorinox produces and sells unique, high quality products worldwide which are of practical use in differing areas of life. The company’s headquarters are located in Ibach, Schwyz, Switzerland since 1884.The right tools always make the job at hand more pleasurable, especially in the kitchen. 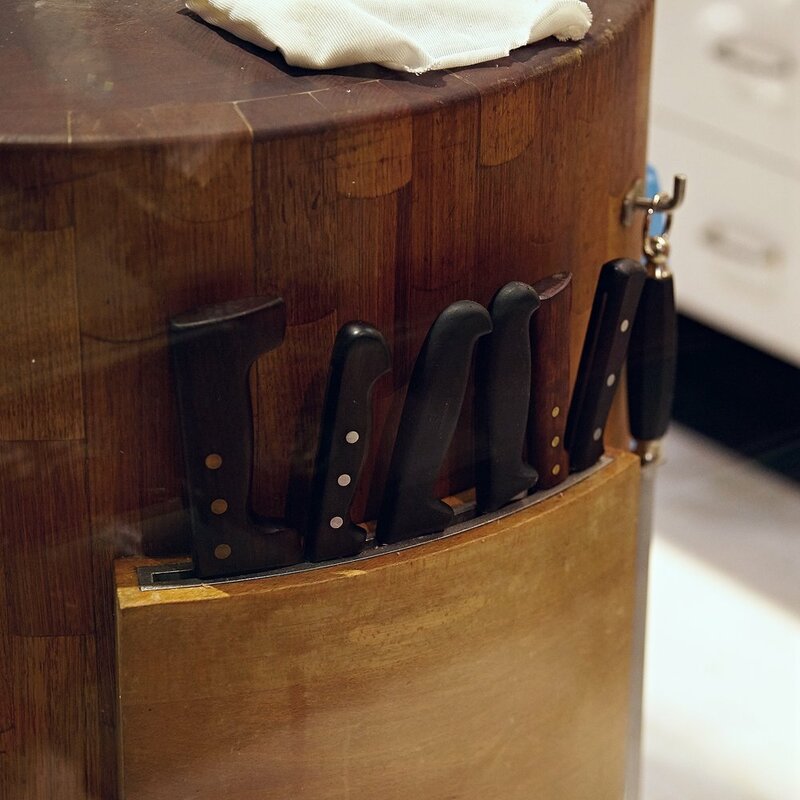 And that's why Victorinox puts its passion into creating household and professional knives that are ergonomically designed and exceptionally sharp. Whether you use it in your five star restaurant or in your home kitchen, you'll feel like a pro with every slice, dice and chop. Redleaf Farm is located in the NSW Southern Highlands and is operated by Katrina and Sam Sparke along with their family of 4 children. They firmly believe that the best tasting meat is from happy animals and specialise in sustainably raising their free-range Saddleback pigs, Border Leister/Merino lambs and grass fed Black Angus beef. As a small family farm, their stock numbers are low enabling them to maintain their preferred hands-on approach – hence their produce is seasonal and very special. Pepe Saya Cultured Butter tastes different, and here’s why: the butter is made using single origin local cream to which a lactic culture is added before being aged for up to four weeks. After the cream has fermented and become sour it's washed, worked by hand, then lovingly shaped and wrapped. Pierre Issa (aka Pepe Saya) never dreamed he’d become a butter maker, but when he discovered that there was no artisan butter being made in Australia, butter quickly became his life. exceptionally authentic range. The result is a pure and authentic product with a smooth, clean palate, patiently nurtured for many months or sometimes years, just the way they have been made for centuries. The quality lamb provided by Cowra Lamb is tender with a rich, full flavour. Breakout River is situated along the banks of the Lachlan River, at the head of the Lachlan Valley, which is classed as one of the most fertile valleys in the world. The ideal pastures and fodder crops grown in the region coupled with premium genetics in the breeding, result in Breakout River Lamb having one of the best reputations in Australia. Macleay Valley Rabbits have firmly established themselves as one of Australia’s premier producers of white rabbit. As a result of their dedication to the healthy breeding of their rabbits and quality feeding program, Macleay Valley White Rabbit is tender, delicious and flavoursome. Uniquely flavoured smallgoods influenced by a Croatian heritage, the Skara family have brought their traditional artisan smallgoods to the Adelaide Hills. Anthony Skara, passionate foodie and his dedicated team, have won a multitude of awards and are leaders in producing true artisan style smallgoods. Black Forest Smokehouse select the best Australian pork, the freshest herbs and spices, and combines them using family recipes passed down through four generations. The result? Consistently succulent, flavoursome hams, bacon, cold meats, breakfast sausages and salamis. Ethically raised pasture and milk fed veal from Camden Valley is a light pink colour in comparison to traditional white veal. The calves are raised on a complete diet and able to roam on pasture. The farm is located in Camden on the fringe of Sydney where calves are offered a full diet to promote health and wellbeing. The result is a pink coloured meat, a delicate texture and a subtle flavour that only free range veal can offer. Mottainai is a Japanese term conveying a sense of regret concerning waste. Along with pasture, Mottainai lambs enjoy a ration of imperfect carrots and sedimentary olive oil produced in the paddocks that surround the farm. If not consumed by the lamb, these products would be destined for landfill. The Arnott family have bred and grown Shorthorn cattle at ‘Hanaminno’, Boorowa for 45 years. Shorthorn cattle are ‘the breed that built Australia’, and are the most versatile and reliable breed in the country - producing consistently high quality beef. They're fantastic mothers with wonderful temperaments and tremendous meat marbling characteristics. Originating from Galloway in Scotland, Belted Galloways are a heritage breed of cattle. John and Kate Blackwood at Ashrose Farm in Orange NSW pasture raise the Belted Galloways in a stress-free and chemical-free environment, respecting ethical practices, natural processes and a rotational grazing system. The mission of Iggy's Bread of the World is to make bread of the highest quality and integrity. Iggy's makes old-fashioned, naturally leavened, heart-baked breads using the finest ingredients. Whenever possible it means organic produce, organic grains, and organic flour. At the very least it means pure and natural ingredients. Crack Willow Farm is located in Oberon on the Central Tablelands of New South Wales. All pigs at Crack Willow Farm are pasture-raised, living entirely outdoors and roaming paddocks with sun on their backs - as nature intended. At Warialda in Clonbinane Victoria, Belted Galloway cattle are grazed entirely on grass for the duration of their lives, giving the meat exceptional flavour, colour, and texture. The cows live a happy life out in the open, as a herd. Parkesbourne Produce grows cool climate berries that are anything but common. Including alpine strawberries and gooseberries, the extraordinary berries are cultivated with consideration for the natural environment and soil biodiversity. Isola Chianina beef is 100% grass fed on quality pasture in the high rainfall area of South Gippsland, Victoria. Incredibly slow growing, each animal takes around 5 years to reach Victor Churchill. Each primal cut is dry aged for a minimum of 4 weeks in our ageing room. Being a large, lean animal, it is has a long, clean flavour balanced with the complexities found in grass fed beef. 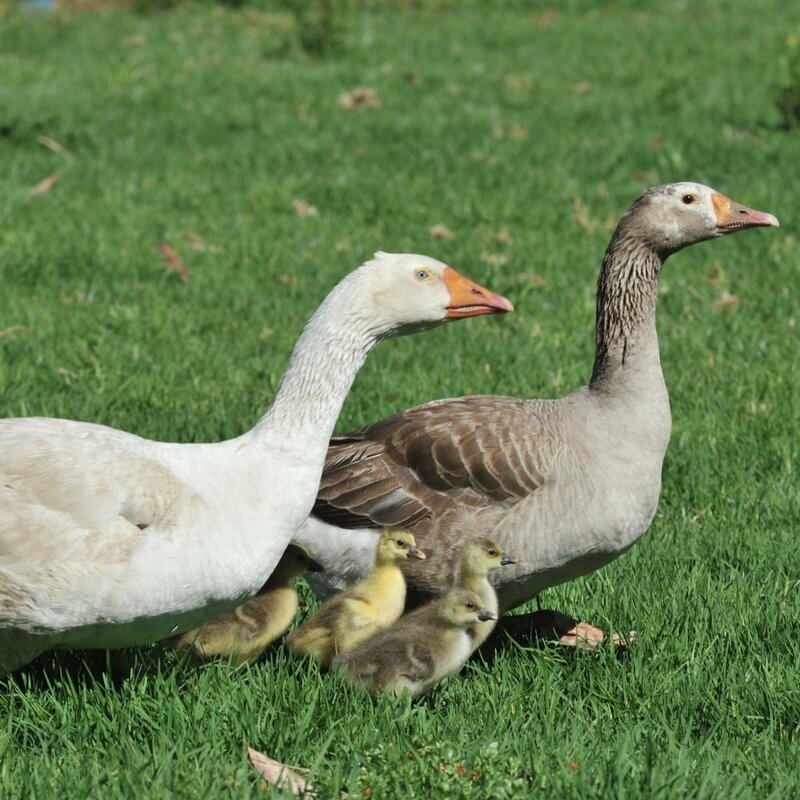 U Goose is farmed by a fifth generation family farm located in Llangothlin, New South Wales. They take pride in nurturing their birds across all stages of their life cycle from the birds naturally laid eggs under the Eucalyptus Gums in the paddocks all the way to a plump, flavoursome goose. their flocks, allowing the birds to express what is essential and natural to their own behaviour. Priding themselves on sustainable farming practices, Burrawong Gaian raises premium pasture-reared chickens and ducks. Roaming in an open-range environment allows the ducks and chickens to forage and express their character. With a paddock-to-plate philosophy and ethical farming methods, Burrawong Gaian are the only accredited free range poultry producer by Humane Choice.